Marana School District is very large. I -10 runs through the school district. Therefore the Marana School District Boundary Map is shown in 2 parts. The school district boundaries that are East and West of I-10. 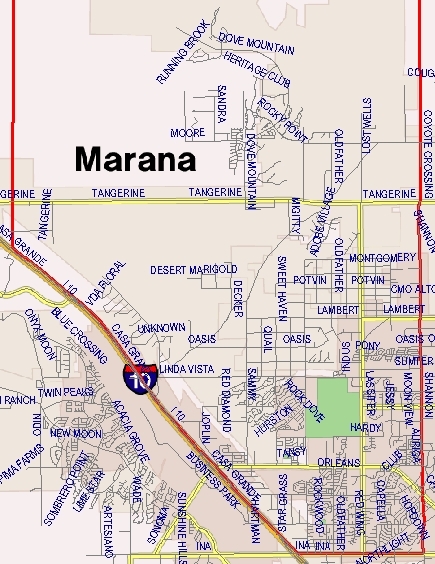 This map shows the Marana School District Boundaries East of the I 10 highway. View the Marana School District Boundary for the area West of the I-10 highway – WEST MUSD. The Marana Unified School District #6 is geographically one of Arizona’s largest school districts. Marana School District #6 covers about 550 square miles. Located approximately 16 miles northwest of downtown Tucson, the Marana district is an integral part of Tucson’s Metro area. Education in the Town of Marana dates back to the early 1920’s. The graduating class of 1922 consisted of two students. It include eleven elementary schools, one intermediate school, two middle schools, two high schools, and one alternative school. Marana and the Marana School District sits in some of the West’s most beautiful public lands. Marana’s scenic wonders captivate visitors and residents. Marana offers many recreational opportunities. There is space to stretch and fresh air to breathe. The Town of Marana initiated the Parks, Open Space, Trails and Recreation Master Plan in the Fall of 2008. The plan has resulted in recommendations for future. Marana planning will maintained its high level of parks and recreation services as the Town’s population increases. Marana is located between Phoenix and Tucson. Marana offers access to major U.S. markets and dynamic metro centers. Many residents of Marana work in Tucson and at the major employers through out the Tucson area. To learn more about the Marana Unified School District go to the MUSD Website. For additional information on the Town of Marana go to the Marana Website. Looking for Property For Sale Tucson? We Can Help! Questions about the Tucson Real Estate Market or Marana Homes for Sale? Call Us 866 316 5575 OR complete the CONTACT FORM and we will get right back to you!